As predicted, maximalism is one of this year’s biggest trends, bringing fun and happiness into our interiors. We’re seeing it at tradeshows, in furniture design, fabric and wallpaper prints, and accessories. Maximalism embraces the delicate and intricate, the bold and contrasting, with luxurious fabric, rich color, metallic accents, and layered patterns. It says “more is more” in contrast to minimalism’s “less is more.” This is a fun style to use, but it can be a design challenge. Try these tips to incorporate this exciting trend into your home, even if your style is more traditional. Start small. Try on maximalism by adding new pillows, or a set of ornate glasses and delicately patterned dinnerware, detailed hardware. 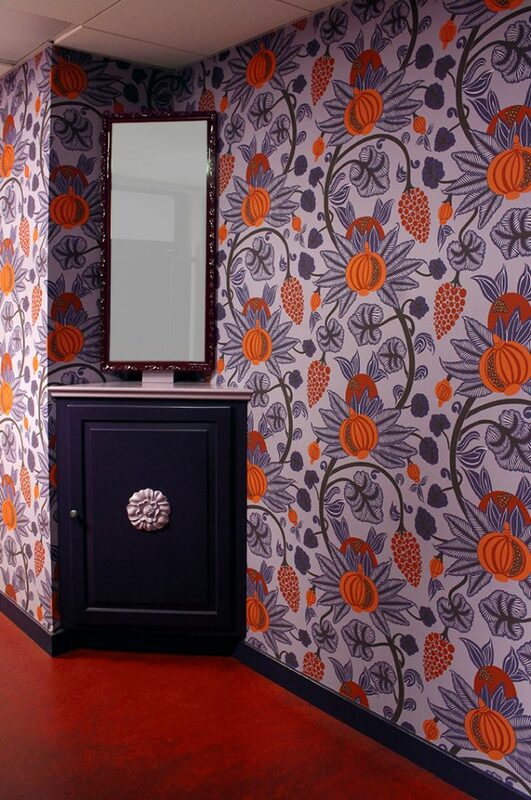 If you’re feeling brave, try an intricate or large patterned wallpaper in a niche or above wainscoting to get comfortable with bold design. Layer texture and pattern. Try a bold striped sofa, with large floral patterned pillows. Layer textured solid throws on couches and chairs. Be sure to mix the scales of your patterning. Be consistent. Pick a theme, such as nature-inspired, or choose a color from artwork or fabric. When using lots of texture and pattern, giving the eye something consistent to identify helps the design. Large-scale art. Switch out a few small pieces of art with one large-scale, dramatic piece or mirror, or create a collage with smaller pieces that fill the expanse of the wall. Large-scale wallpaper on an accent wall creates instant captivating art. Detailed tapestries are also popular as wall or floor art. Use what you love. Gone are the days of running away from items that don’t “match.” Choosing what you love is at the core of maximalist design. If your heart says “yes”, you can mix it in. For example, take a Bombay chest and paint it a bold blue, place it on a patterned wall, and add a textured mirror to complete the look. Your home should reflect you – designing with maximalism allows you to mix the colors, prints, textures, and accessories that make you happy. It’s fun, it’s bold, it’s challenging, don’t be afraid to ask for help.